On January 17, 2019, with support from the Green Climate Fund, the United Nations Development Programme (UNDP) and other partners, Vietnam announced that the nation is preparing to regenerate 1300 hectares (3250 acres) of coastal mangroves over the coming year. Simultaneously, they will build over 1300 storm-resilient houses. Rolled out under a climate change adaptation initiative “Improving the resilience of vulnerable coastal communities to climate change related impacts in Vietnam,” the new homes and mangroves will help protect impoverished coastal communities from increasing flooding and storms while also boosting livelihoods, nurturing biodiversity and supporting Vietnam in its pursuit of a low-carbon, climate-resilient future. Viet Nam is taking strides to both reduce its emissions and to prepare for projected climate change impacts. These efforts go hand-in-hand with the Southeast Asian nation’s aspirations in reaching the Sustainable Development Goals (SDGs) under the 2030 Agenda – the goals are interconnected with the addressing climate change (SDG 13), the goals of eradicating poverty (SDG 1), reducing inequalities (SDG 10), and ensuring sustainable cities and communities (SDG 11). The announcement came on January 17 at a Steering Committee meeting for the project organized by the Ministry of Agriculture and Rural Development, UNDP and the Ministry of Construction, chaired by Deputy Minister of Agriculture and Rural Development Hoang Van Thang, Head of the Project Steering Committee, and Ms. Caitlin Wiesen, UNDP Vietnam Resident Representative. Attending the meeting were representatives from the Ministry of Planning and Investment, Ministry of Agriculture and Rural Development, Ministry of Construction, Department of Housing and Real Estate Market Management, General Department of Forestry, Vietnam Disaster Management Authority, Vietnam Women’s Union, provincial leaders, and Project Management Units of Nam Dinh, Thanh Hoa, Quang Binh, Quang Ngai, Quang Nam, Thua Thien Hue, and Ca Mau provinces. According to the Global Climate Risk Index, between 1997 and 2016, Vietnam ranked eighth among the world’s top ten countries most affected by extreme weather events. Impacts of climate change on its agricultural, forestry and fishery sectors are expected to be severe. Recognizing the challenges, the Government of Vietnam is engaging with the challenges and taking action, with the support of United Nations partners including UNDP, developing its policy frameworks (the government released a ten-year National Climate Change Strategy in 2011), integrating agriculture into its National Adaptation Plan and developing its National Determined Contributions under the global Paris Agreement for climate action. 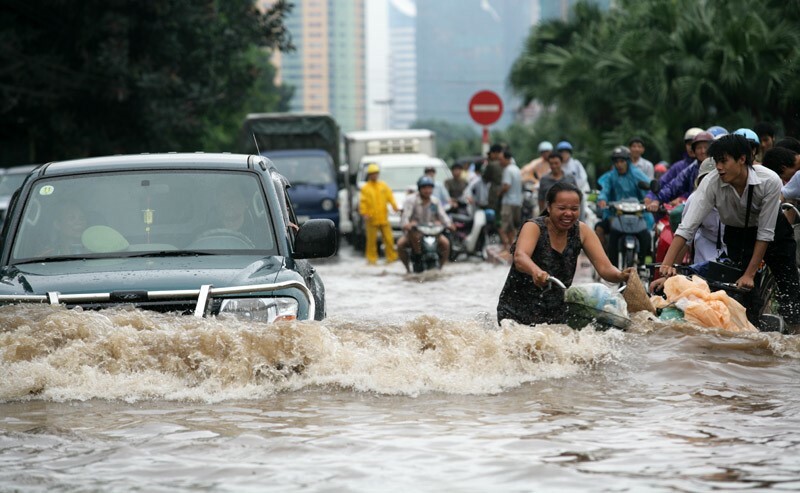 Photo of 2008 Hanoi flood by Nguyễn Thanh Quang via Wikipedia. See United Nations Development Programme website.